Racial disparities in income and other outcomes are among the most visible and persistent features of American society. The sources of these disparities have been studied and debated for decades, with explanations ranging from segregation and discrimination to differences in family structure and genetics. Most previous work on racial disparities has studied inequality within a single generation of people. We analyze how racial gaps change across generations, allowing us to identify the factors that lead to disparities between racial groups that persist over time. 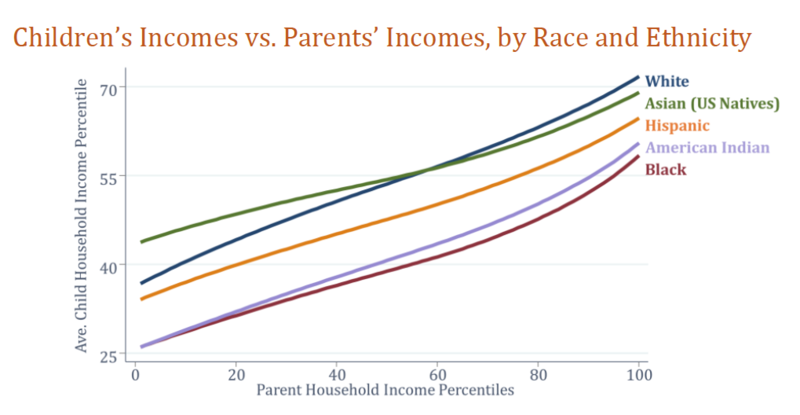 Using de-identified data from the U.S. Census Bureau covering 20 million children and their parents, we measure the differences in incomes in adulthood between children of different races who grow up in families with similar parental incomes. We show how these intergenerational race gaps vary across areas of the U.S. and discuss implications for pathways to reduce racial disparities. The incomes of Hispanic and Asian Americans are approaching those of white Americans over generations; those of Black Americans and American Indians are not. The black-white intergenerational income gap for children at the same parental income level is primarily accounted for by differences in men’s not women’s, outcomes. Differences in family characteristics – parental marriage rates, education, wealth – and differences in ability explain very little of the black-white intergenerational gap. 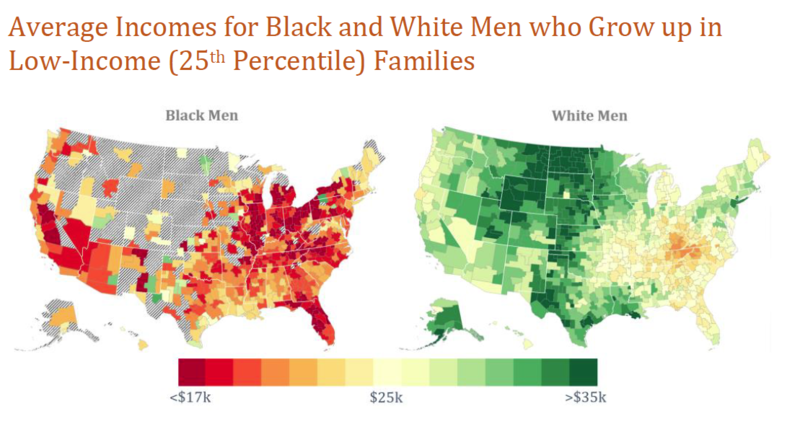 In 99% of neighborhoods in the United States, black boys earn less in adulthood than white boys who grow up in families with comparable income. Both black and white boys grow up to have higher incomes from low-poverty areas, but black-white intergenerational gaps are actually larger in lower-poverty neighborhoods. Within low-poverty areas, black-white intergenerational gaps are smallest in areas with low levels of racial bias among whites and high rates of father presence among blacks. The black-white gap is not immutable. It is shaped by childhood environment. Childhood exposure to neighborhoods with higher outcomes and lower race gaps both increases outcomes and produces smaller gaps in the next generation. What does this mean for policy? Our results show that the black-white gap in upward mobility is driven primarily by environmental factors that can be changed. But, the findings also highlight the challenges one faces in addressing these environmental disparities. Black and white boys have very different outcomes even if they grow up in two-parent families with comparable incomes, education, and wealth, live on the same city block, and attend the same school. This finding suggests that many widely discussed proposals may be insufficient to narrow the black-white gap themselves, and suggest potentially new directions for policies to consider. Policies focused on improving the economic outcomes of a single generation – such as temporary cash transfers, minimum wage increases, or universal basic income programs – can help narrow racial gaps at a given point in time. However, they are less likely to narrow racial disparities in the long run, unless they also change rates of upward mobility across generations. Policies that reduce residential segregation or enable black and white children to attend the same schools without achieving racial integration within neighborhoods and schools would also likely leave much of the gap in place. Our results suggest that the most promising pathways to reducing the black-white gap are those whose impacts cut across neighborhood and class lines. They also could focus particularly on improving upward mobility for black men. There are many promising examples of such efforts: mentoring programs for black boys, efforts to reduce racial bias among whites, interventions to reduce discrimination in criminal justice, and efforts to facilitate greater interaction across racial groups. We look forward to partnering with organizations and practitioners engaged in such efforts to evaluate their long-term impacts on mobility systematically and build a knowledge base that can lead to scalable ways to increase opportunity for racial minorities. Explore our downloadable library of data sets, papers, and presentations related to race. Black men face economic disadvantages even if they start out in wealthier households, new study shows. Is your organization working to address these issues? Contact our policy team to explore how we can work together.